What are the dimensions of a MD? What is the storage capacity of MDs, CDs, DATs, DCCs? What is the minimum allocation unit when recording on an MD? What is the MD disc space allocation algorithm? Why is MD capacity always the same (74:59 exactly) regardless of how much redundancy there is in the recorded music? What's the difference between the 60, 74 and 80 minute discs? Will MDs of the future contain un-compressed data? Will my MD player be able to play them? How does a pre-recorded MD differ from a recordable one? Is there a difference in the disc layout of a recordable MD and pre-recorded MD? How many times can I record on a recordable MD? How long can the data/audio be stored on a recordable MD? What is the status of Sony's push to have MDs replace CD-ROMs? Can an MD Data drive be used to access the ATRAC data on an MD Audio disc? Blank MDs are now available from several manufacturers. Do they all perform equally well? The only information available to me is the relative pricing so on what other basis can a reasoned choice of brand(s) be made? I've heard that after many recordings and edits an MD can become fragmented, is this a problem? MD Lens and Head cleaning discs are being sold, do these help? When a Sony MD deck (pre-MDS-JE520) is in record-pause mode, the disc is spinning and the magnetic head is in contact with it. How long can it safely be left in this state? Is there an audible difference between modern MD and CD/DAT? What is ATRAC exactly? How does it compare to PASC? What is the bit rate of the Minidisc's ATRAC audio after compression? How does ATRAC compare with MPEG compression? At what bitrate would an MPEG file be equivalent to a song compressed with ATRAC? If I use digital connections between an MD player and MD recorder, why can't I make an exact copy of an MD? What else (besides compression) affects the sound quality of MD? Does ATRAC have "forward compatibility," or is it a static algorithm? Does the ATRAC version affect the quality of the recording or the playback? What's the difference between the various ATRAC generations, and how well do they interoperate? What actual changes have been made to ATRAC over the years? Is there any loss of information when I record from a CD? When I record from tape, microphone, or other analog sources? I don't have the equipment to make a digital recording, will my recordings sound okay? Many have suggested setting levels manually when recording from analog sources. Any tips for how to best determine the correct level using the MZ-R3's and -R30's feeble little LCD bars? Is it worth it to get the equipment necessary to make digital recordings? Which ATRAC chips are in which MD units? I've heard some negative comments about optical digital interconnects. Does is matter whether I use optical or coaxial digital input when recording to Minidisc? Is jitter a problem? What's the scoop on digital connectors, and how can I make a digital connection between my source device with its digital coaxial output connector and my MD unit with its digital optical input connector? I see MD equipment with 16, 20 and even 1 bit DACs (Digital to Analog Converters), what's the difference? Dolby ProLogic Surround is encoded in the stereo signal through phase shifting. Does the MD's transform coding interfere with the "Surround" information after recording and playback? Do MDs skip during playback? Why not? Does the size of the music buffer vary from player to player? Does MD have any special editing features for recording? What is Scale Factor Edit? What happens if I bump my player when I'm recording? How flexible is the process where I put the titles of the tracks on the MD? Is there a limit to the length of the titles? Is there anyway I can "undo" an edit operation if I delete the wrong track while editing? MD equipment bears the label ``US and Foreign Patents licensed from Dolby Laboratories Licensing Corporation,'' why is that? Is there an adapter for the strange little headphone connector on the MZ-E3's remote? Is there a Sony distributor I can order things from? Where can I order parts and service manuals? Where is a good US Service Center for MD repair? Where can I get a case for my Minidiscs? How can I make labels on a computer for my MD sleeves? On the Sony LIP-12 batteries, there is a little switch with a red dot in one position, what is this for? What encoder is used for MDLP? ATRAC3? Isn't that a step backwards? I thought modern Sony MD equipment was up to ATRAC 4 or something. Oh that ATRAC3. Then what happened to ATRAC2? Can the new LP mode tracks be played back on old, non-MDLP hardware? What happens when I try to play an LP track on old, non-MDLP hardware? Will the new MDLP units play back old ("SP" mode) discs? Will the new MDLP units record "old" (SP mode) tracks? Can old non-MDLP units title MDLP tracks? You mean that 10% of an MD's capacity is wasted in LP mode due to lack of planning!? Why aren't there LP monaural modes that double the recording time? If LP4 mode's left and right channels are coded jointly, then what kind of channel separation does it have? How high quality is the LP mode audio? Will an MDS-W1 move LP mode tracks? How can I try out ATRAC3 and listen to some samples? What about the ATRAC3 that Real Networks Supports? Where can I learn more about ATRAC3? What happens if MD hardware is made to play MD audio data in the wrong mode? Are there translations of the MDLP section of the FAQ? Why is it considered a "format extension"? What NetMD software packages are there? What restrictions does NetMD impose on transfers? What is known about the information transferred over the USB link? Is there any way of transferring MP3s to MD without using OpenMG Jukebox? Wouldn't the transfers go even faster with USB 2.0? What other NetMD FAQs are there? I just don't get this Minidisc thing. Could you please sort it all out for me in a clear and simple way? Is it true that you can re-record on Mindisc? I heard you can record mp3's to the MD, then shuffle them around, delete some and add more later. Is that right? Why should I buy an MD recorder over a standard portable CD player, especially with the new CD-R drives for people's computers? I hear that Minidiscs are "near-CD quality", and use compression. How do they sound in comparison to CDs? Can anyone tell the difference? How do you transfer a CD track to a Minidisc? Since Minidisc is a digital format, isn't there a Minidisc drive that can be connected to a computer for direct transfers of audio between PC and MD? Can Minidisc carry MP3's or other computer music formats? But can I use Minidiscs to hold actual MP3 or other computer files? How do you record music from the radio? Can MD connect to a cassette or deck in any way? I'm still confused, can you just tell me what cables I need? What are some other things MD records from? Enough about recording to MD... can I record from MD unit to my computer (or another audio device)? Can all things be done on a portable Minidisc recorder that can be done on a larger Minidisc deck? What's the difference between a player and a recorder? Has a portable MD unit ever been released that has a built-in AM/FM tuner? I've heard rumors that Minidiscs are on their way out... is MD a sinking ship? What's the difference between an MD and the 3-inch CD-Rs used in the Sony CD1000 digital camera? Sony sold a digital camera in Japan in 1998 called the Cybershot DSC-MD1 that recorded images to an MD. What is the difference between that technology and the technology used to record images to a CD-R? What I was mainly wondering about is the disk technology itself. If you took an MD out of its cartridge and compared it with a CD-R, other than size, what are the differences? I recorded from the radio to MD, titled the tracks, and then digitally copied that MD from my home deck to my portable MD recorder. The audio and track marks were copied, but the track titles I made were not. Why is that? If I took an MD out of its cartridge, could I play it in one of those new mini-CD players such as Compaq's PM-1? If you have the PC-LINK that comes with the MZ-R500, MZ-R700 and MZ-R900 recorders, will it work with the newer MD recorders (eg.MZ-R909, R910, etc.) and/or older ones (eg. MZ-R90/91, MZ-R70, etc.)? My friend claims he can record movie quotes via the optical line in using his Sony MD and DVD player. I am not sure of the model of either of his players, but both were purchased in Europe. However, when I tried recording this way I was given the error message 'NO COPY'. I can still do recording from DVD using the analog connection but it would be easier with the optical cable. My DVD player is a Sony with an optical output and my MD player is the MZ-N707. Why can't I use the optical line for this recording? 7 cm (2.75") x 6.75 cm (2 21/32") x 0.5 cm (3/16") The disc inside is 64 mm in diameter. About 2 seconds for "SP" mode audio, 4 seconds for "SP" monaural, 4 seconds for "LP2" and 8 seconds for "LP4" mode audio. Audio information on Minidisc is organized in cluster units, which constitute the minimum unit for write or over-write of data to the disc. Each cluster contains 32 sectors of audio data, 3 "link sectors", and 1 sector of "sub data". Each sector is 2332 bytes, and 2 sectors are grouped together into a 4664 byte block holding 11 sound groups. Each sound group is 424 bytes and contains 11.6 msec of SP stereo data or 23.2 ms of SP mono data (LP2 and LP4 are double and quadruple the SP audio duration). A cluster is then 74624 bytes (32*2332), containing 176 sound groups (74624/424), for 2.0416 seconds of stereo sound (176*11.6) or 4.0832 seconds of monaural. See also the section on Prerecorded vs. recordable disc layout. The sound group (1/86th second) constitutes the finest resolution at which the audio stream can be edited. Older consumer grade MD decks have an edit positioning accuracy of approx. 60 msec (5 sound groups) but many modern machines allow edit positioning in units of a single sound group (11.6ms). On a frame by frame (11.6 ms) basis, ATRAC is always trying to give as much resolution as it can to each spectral component that it deems important. However it is continually short of bits, and except for the case of zero input, or a very simple signal (e.g. a few pure tones), ATRAC is using all the bits per second it has available. If it had more bits per second available it could use them, and record the signal with better sound quality. In Sony's AES paper on ATRAC they talk about the bit allocation algorithm, and how it in general allocates more bits than are available, so they have a method for subtracting an offset from the allocations in order fit within their bit budget for a sound frame. In the zero or simple input case, there can be unused bits in some frames, but since there is an unvarying (i.e. fixed) relationship between 11.6 ms of audio and a 424 byte "sound group" on the disc, the system is not flexible enough to actually take up less disc space when it doesn't need it. The pregroove wobble is at a higher linear frequency (cycles/cm.) on the 74 minute blanks, causing the recorder to spin the disc slower (74 min: 1.2 m/s vs. 60 min: 1.4 m/s) and thereby record more information in the same linear space. The 80 minute discs are made by decreasing the track pitch (i.e. space between tracks) from the MD standard's 1.6um to 1.5um (micrometers), the minimum allowed by the MD specification; like the 74' blanks, they also run at 1.2 m/s. There is also information encoded in the read-only TOC near the inner circumference of the disc telling the player how long the disc is. Originally it was difficult to make the 74' blanks, but nowadays the manufacturing costs of 60' and 74' discs are the same (as well as, presumably, the 80's). Sony produces high density Minidiscs and drives with a capacity of about 650MB for their MD Camcoder. Such capacity would allow a CD's worth of data to be stored uncompressed on an MD. However, new audio MDs made with such capacity would be incompatible with the existing hardware base (see below), and (assuming 16 bit linear recording), would not increase audio fidelity substantially. The main benefit of uncompressed recording would be the ability for professional users to make perfect MD duplicates. If the high density MD data drives become popular, it is possible that professional MD audio equipment will be made which uses MD data discs to store uncompressed audio. No, with their 4X increase in density the discs are physically incompatible with existing equipment. Physically, a pre-recorded MD is just like CD, using the same optical parameters, material, and production methods. Only the data contents are different (compressed ATRAC audio vs. 16 bit linear PCM audio). Unlike recordable MD, pre-recorded MDs do not have the magneto-optical coating layers or the lubricating layers. They are made with the same plastic-aluminum structure as CDs, so there is no way to record or erase anything on them. Prerecorded MD's are also read exactly like CD's (the player focuses a laser on pits and valleys within a transparent polycarbonate substrate backed by a coating of aluminum thus reflecting or dispersing the beam). Recordable MD's are similar, but a pre-groove replaces the pits and valleys and an MO coating replaces the aluminum one. When recording, a laser is focused from one side of the disc onto the pre-groove and heats a spot on the MO recording layer to its Curie point while a magnetic field from a head in contact with the other side of the disc aligns magnetic domains within (read: magnetizes) the heated spot on the MO layer (the N/S orientation corresponding to 0s and 1s in the data). During playback the MD machine focuses the laser on the pre-groove again, but at lower power, and the data is read back by measuring changes in polarization of light reflected from the previously magnetized regions (the Faraday effect). In order to playback both pre-recorded and recordable media, all MD units have a dual function optical assembly which can, depending upon the disc type, detect changes in either reflectivity or polarization. In terms of audio quality, pre-recorded MDs are in theory no different than recordable MDs, although, as always, audio quality depends upon which version of ATRAC the discs are encoded with. Some users have noticed certain pre-recorded MDs that sound worse than a homemade copy of the same CD with a modern MD recorder. It's likely that the ATRAC encoders used for prerecorded MDs are improved over time just as they are in the consumer units. Finally, recordable MDs have an extra hole in their case, which is sensed by a microswitch within the MD unit that connects to the REFLECT pin of the microprocessor. It tells the MD player's microprocessor whether signal reflectivity is high (for pre-recorded) or low (for recordable). On recordable MDs, 32 out of 36 sectors in every cluster (the smallest recordable unit) are used for storing audio data. Of the remaining 4 sectors, 3 are needed to accommodate the start up and run out of the error correction code, as stated in the Minidisc IEEE paper: ``Because of the long interleaved ACIRC error correction code, three sectors must be used as "linking sectors." If the user changes or adds new data to the MD disc, two or three sectors for every start and end position of the new data need to be recorded.''. In other words, some space is wasted to accommodate re-recordability. On pre-recorded MDs, however, the data is fixed during mastering as one continuous stream, so these 3 extra sectors can be devoted to sub-data (but there is no documentation as to what this extra sub-data space could be used for). The Sony DADC MD handbook says that the maximum duration of a pre-recorded MD is 78:16. Sony claims a blank MD can handle up to 1 million recordings... Time will tell! In practice, the user Table of Contents (user TOC or UTOC) of an MD could become messed up by accident (defective MD recorder or physical damage) and render the MD unusable. The Sony portable MD recorder (MZ-1) allows to recover some unusable MD's in test mode (machine open and test jumper in place) via the TOC erase function: the TOC gets obliterated and that results in a "like-new" blank MD. Physical damage to the TOC cannot be repaired, but similar defects in other parts of the MD should be removed from the available space by creating short quiet tracks that include the problem and recording after labeling these as "bad". 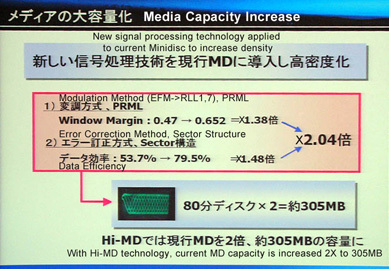 Sony claims in their Magneto Optical FAQs that data may be stored with magneto optical technology for more than thirty years without loss or degradation. Once written to the disk, data are safe from the magnetic fields and heat found in normal environments. However, strong magnets placed directly against the MD can destroy data, as evidenced by informal experiments conducted by users. In contrast, a modern (ca. 1999) 'silver' pressed CD from a glass master is reckoned to last around 50 years or so from a chemical point of view. However a problem was found with the chemistry comprising early CD's (of around seven years and older) which caused degradation within a decade. Sony wanted MD-Data to replace 3.5" floppy-disks (1.4 Mb, 2.8 Mb and 21 Mb floptical), not CD-ROM (a well implanted medium in the computer industry by now, and currently cheap). MD-Data's first incarnation was the MDH-10 SCSI drive, it provided 140 MB of data storage on an MD but was slow, expensive and incompatible with the Audio MD format (Data drives cannot read or write audio MD data except in "play" mode, which does not provide computer access to the data.). Sony subsequently released the MDM-111 for use in the IBM Thinkpad, but neither drive became popular and the MD-Data format has effectively been shelved, and appears only in certain niche products such as the MD still camera and MD document scanner. No, there is a read-only label track on each MD that distinguishes an MD Audio and MD Data disc, MD equipment looks at this label to determine what kind of disc it is accessing. An MD audio disc inserted in an MD Data drive shows up as having 1k in disc, 0k available. The ATRAC encoded music information is not accessible. An MD Data drive user has written some information about the MD Data drive and cross compatibility. Since MDs store digital data, there will be no qualitative difference between the sound of various discs so long as the disc's raw bit errors fall within the bounds of what can be handled by the MD ACIRC error correction system. Presented here are the results of a small experiment I conducted to compare the raw block error rate of various brands. The service manual for the Sony MDS-503 Minidisc Deck tells how to put the unit into test mode, and from there how to display the BLER (raw block error rate [per second]) as it reads the disk. Using this feature I compared the block error rates of TDK, Idemitsu, Maxell, Panasonic, Sony and Keep blanks. In Andy Poggio's CD paper he says: "The CD specification allows for discs to have up to 220 raw errors per second. Every one of these errors is (almost always) perfectly corrected by the CIRC scheme for a net error rate of zero." I have reason to believe that 220 is the threshold for MD as well, since MD uses [modified] CD logic for encoding data on the disc, and since 220 is actually one of the error thresholds used for setting the MDS-503 focus bias. The un-surprising result: No discs had anywhere near an BLER of 220. The procedure is to use "continuous recording" in diagnostic mode to make a test disk, then look at the error rate while reading back from the disk. The table below shows the average and maximum BLERs for each brand. "In", "mid", and "out" refer to the three areas on the disc which are tested by default, they begin at cluster 40, 300, and 700 respectively. Same TDK disc -- ejected and reinserted. Same TDK disc -- written once again with diagnostic. Disc contained a known bad spot (but not in test area). (Old) Gray Sony. Reported address errors. Some discs had been recorded on previously in normal audio recording ("non-continuous") mode. The BLER of these areas was typically 20-50, and always higher than the areas made with "continuous-recording" in diagnostic mode. The Sony disc was the only surprise, perhaps it had a weak/bad spot. In any case, it was still well within the presumed threshold for CIRC. I am not sure if comparative quality judgements can be made from these results since the tests were done on three short (approx. 10 second) intervals of each disc. I think the main conclusion is that all the discs are well within the threshold of "identical" from a post error correction point of view. Magnetic layers with practical Curie temperatures are made from proprietary alloys of iron, cobalt, platinum, terbium, gadolinium and various other rare earths. These are all highly susceptible to corrosion in air and are also incompatible with the plastics used for moulded substrates. The magnetic layer must be protected by sandwiching it between layers of material which require to be impervious to corrosive ions but which must be optically transmissive. Thus only dielectrics such as silicon dioxide or alumnium nitride can be used. The master is developed and electroplated as normal in order to make stampers. The stampers make pre-grooved disks which are then coated by vacuum deposition with the MO layer, sandwiched between dielectric layers. The MO layer can be made less susceptible to corrosion if it is smooth and homogeneous. Layers which contain voids, asperities or residual gases from the coating process present a larger surface area for attack. The life of an MO disk is affected more by the manufacturing process than by the precise composition of the alloy. So, perhaps, more expensive discs might last longer (rather than have a lower initial error rate). I don't know the real situation though, maybe all the manufacturers have excellent quality control. My comments are with reference to modern MD machines (ca. 1996), I am unfamiliar with the behavior of the older units. I am also speaking based upon my observation of simple experiments on an MDS-503, not on any intimate knowledge of MD technical specifications. There are two potential problems with fragmentation: interruption of music due to excessive seeking, and loss of free space. Concerning interruption of music, fragmentation alone will not cause a problem. A typical MD player can buffer 10 seconds of music and read the disc at 150 Kbytes/sec. (roughly the 1x CD data rate) which is over 4 times the MD audio rate. You will only have problems if it takes the player more time over any 10 second period to access and read segments of music than it does to play them. My simple tests with the '503 showed that it could not keep up with an arbitrarily long string of 2 second segments located at alternate ends of the disc (on a 74' MD), but that it could with 4 second segments. Assuming a full stroke seek takes about 2.3 seconds (measured by listening to the unit seek) and 3 seconds of music can be read in about 0.7 seconds, it would seem that the smallest segments a player could keep up with on a continual basis would be about 3 seconds long if they were located at worst case locations on the disc, and would cause the player to be constantly seeking and reading. You would need to have a string of segments this size or smaller, for at least 10 seconds duration, at opposite ends of the disc, to cause a problem. This simply cannot happen through fragmentation alone since all free list segments are at least 12 seconds long (see below). A worst case seeking condition that caused intermittent muting could still be created if 3 second or shorter segments from opposite ends of the disk were catenated together, but free list segments are allocated in sorted order (see FAQ section on allocation), so that unless you are trying to create such a pattern, you are rather unlikely to make one in the normal course of editing. The free space problem is caused by unused segments of disc space less than 12 seconds long that are not available for reuse. My simple tests showed that whenever the MDS-503 could coalesce space it did, so that lost space is only a problem when many small unused segments less than 12 seconds long are scattered throughout the disc, not adjacent to any existing free space. It is possible that in a normal editing operation of deleting dead space between tracks, up to 12 seconds per track could be lost, and on a disc with 25 tracks that would be 5 minutes lost to fragmentation. Though this does not seem troublesome, one real problem may occur in a sound effects application where all the tracks are tiny (< 12s), since if you were to delete every other track, nothing could be coalesced and there would be no change in the amount of free space. Though the degree of fragmentation depends upon your recording and editing patterns, I cannot see it causing problems in any but extreme circumstances. It should also be noted that all fragmentation is eliminated when an "Erase All" operation is performed. This restores the disc to a single TOC entry containing all the free space. However, Arnaud Devilder (MPO MD disc sales manager) says: "I have to say that these products are only MARKETING. Avoid using them, we saw in our test labs that these products are very bad for your hardware." A very high durability of the [magnetic head] contact cycle can be achieved, e.g., more than a million passes. Taking the worse case scenario, an MD machine left in record-pause mode at the lead in (i.e. innermost) area of the disc [diameter: 32mm] and running at the highest linear velocity (1.4m/sec) would spin at [1.4/(.032*3.14159) * 60] = 836 rpm. At this speed, 1 million revolutions [passes] would take approx. 20 hours. So, record-pause for several hours is okay. A day or two is probably not. Here's a tip when recording a CD unattended: put the CD player in repeat-all, this will cause the MD player to record to the end and stop (rather than go into record-pause). You can easily delete the extra tracks later. A small double-blind test made by the ABX Company found that subjects did not find a difference between ATRAC processed music and its original, but could readily spot the difference when a special test signal was used for the comparison. However, one significant difference with DAT is that differences with the original increase in each subsequent copy generation, even when recording digitally. Each time the MD is played, a full 16-bit data stream is regenerated from the compressed data. Each time it records, the input data stream is recompressed. The artifacts of the compression process build up from generation to generation. See ATRAC below. Yes. DCC uses a lower-loss compression algorithm than MD (4: 1 vs. 5: 1), and thus could sound better. MD should be compared to DCC with the same DAC, for fair results. Also note that most tests compared the first generation Philips home DCC recorder with the first generation Sony portable MD recorder (MZ-1). ATRAC (Adaptive TRansform Acoustic Coding) divides the 16 bit 44.1 KHz digital signal into 52 sub-bands in the frequency domain (after a Fast Fourier Transform). The sub-bands in the low frequencies are finer than the ones in the high frequency range. A psycho-acoustic transfer function that takes advantage of the masking effect and the absolute hearing threshold then removes enough information to reduce the data stream to 1/5th of the original size. Each channel receives that treatment separately (the Sony MZ-1 portable MD recorder features one ATRAC encoder/decoder chip per channel). PASC (Precision Adaptive Sub-band Coding -- used in Philips now defunct DCC [Digital Compact Cassette]) divides the digital signal into equally spaced sub-bands and removes less information (to only 1/4th of the original size). PASC is essentially the MPEG Layer 1 audio standard (can be decompressed with MPEG Layer 1 players after a trivial preprocessing step). Both are data compression algorithms, used to store the information content from a stream of 16-bit samples in fewer bits. The purpose of compression is to reduce the rate at which the disk has to deliver or record bits, and to reduce the total number of bits stored. There are many compression algorithms. The ones used for computer data (for example in archiving programs) are lossless; the result of decompression is identical to the input. PASC and ATRAC are both "lossy" algorithms. In order to get greater compression, they do not attempt to preserve every bit of the original data, but rather only the acoustically "important" bits. Considerable cleverness goes into finding the sounds masked by properties of the human auditory system, ones that you would not hear even if they were reproduced. By all accounts the two schemes do amazing well, considering they operate in real time. See the AES paper on ATRAC for further technical details. ATRAC3 (used in MDLP) runs at 132kbps (LP2) and 66kbps (LP4). See the MDLP FAQ for further details. ATRAC is 292kbit/sec, giving ``CD like'' audio fidelity. MPEG Layer 1 (i.e. PASC) gives transparent CD fidelity audio at 384kbit/sec, Layer 2 (i.e. Musicam) and Layer 3 give ``CD like'' fidelity at 224kbit/sec and 128kbit/s respectively. A user has compared ATRAC and MPEG Layer 3 and rates ATRAC far better. VQF has a system offering 18:1 compression, pitched as something of an alternative to MP3. The compression of linear (PCM) digital audio into ATRAC format and expansion back again is an asymmetric process. Even if you are compressing and expanding data that has been through the compression and expansion cycle once before, the result of the operation will yield data that is slightly different from what you started with. This may seem strange, since fundamentally it could be done symmetrically. However, there are a few uncontrollable asymmetries in the process. One is the framing of input data. ATRAC starts by breaking the input signal into blocks of 512 samples. If it were possible to arrange that the sample block boundaries created during decompression be used when the signal was further recompressed, it would improve the symmetry of the process. Another is that ATRAC introduces noise, usually at an inaudible level, but in subsequent compression this noise is indistinguishable from signal and can alter what ATRAC determines to be masked, thereby changing the number of bits allocated to each band. Also, mathematical round off error in the compression and decompression calculations may introduce noise as well. In some MD copying experiments done out to 100 generations you can hear the artifacts of the compression process. The technical reasons for generational loss are examined in Frank Kurth's paper An Audio Codec for Multiple Generations Compression without Loss of Perceptual Quality (pdf). The next question then becomes, why not copy the compressed data directly, thereby avoiding the asymmetry of compression and decompression? Unfortunately, consumer grade MD machines do not provide access to their compressed data, nor do they provide a way of directly recording compressed data, even if it were available. The S/PDIF digital interconnect only carries data in the linear (PCM) format. Professional machines however (such as the Sony MDS-B5 with direct ATRAC I/O) do allow exact bit for bit MD copies to be made. The entire rest of the sound reproduction chain is important. The digital to analog converter (DAC) is key to reproducing the sound from the decompressed data. The audio amplifier circuitry is also critical. And there have been reports of MD playback machines (not Sony) that were made unlistenable by poor-quality attached headphones! Every component of the chain from the DAC to the eardrum is important to good sound reproduction. All elements other than the compression algorithm must be held constant before A: B comparisons are made, for example. The encoder (recording) side of ATRAC offers room for improvement from one generation to the next (specifically, in the decision about how to allocate encoding bits so as to best match human psycho-acoustic properties). Thus, MD recordings made on a newer machine with a better ATRAC encoder will sound better than old recordings, even when played back on an old machine. The decoder (playback) side of ATRAC has a fixed structure, and though ATRAC chips are all generally expected to decode with nearly the same quality, increases in digital signal processing accuracy may allow slight audio quality improvements (if those improvements have not already been made to modern ATRAC chips). Since the ATRAC encoder plays the largest role in how an MD sounds, the implication for making digital copies between two MD units is to use the older unit for playback and the newer one for recording. When making analog copies, the relative quality of the A/D and D/A converters must be born in mind. The following sections refer to Sony's ATRAC. Sharp and Matsushita (among others?) have developed ATRAC chips of their own, though rather little has been made public about their evolution. While all manufacturer's ATRAC versions interoperate and are based upon Sony's original specification, it is not possible to compare their version numbers. Version numbers frequently serve to enumerate Minidisc/DSP chip generations as much as actual ATRAC algorithm changes, so there is no direct relation between version number and audio quality. Showing information about each particular ATRAC generation. (From the February '96 issue of the German Stereo magazine. The phrase sparkling noise in the text below is an imprecise translation of Spratzeln, which has been said to be typified by the sound of CO2 bubbles bursting on the surface of a beer). Showing results of recording and playback between various ATRAC versions. In general, all ATRAC versions are fully compatible with each other. However, if you play or record something with 1.0 the result will be rather poor no matter from which version the source came from or goes to. If you take a higher version the result is generally be good enough, when you use ATRAC 3.5 for either playing or recording it gets even a bit better. For portables and car-players with 3.0, the weakest link is the A/D converter. The practical result: buy a 3.5 or better for 'home use', record there, and you get better quality in your 3.0 portable or car-player. Showing results of defeating SCMS copy protection and making multiple generation copies with each ATRAC generation. ATRAC 1 to ATRAC 1 After 5 generations unacceptable, after 20 generations awful. ATRAC 2 to ATRAC 2 After 5 generations no hearable difference, after 20 generations tiny distortion. ATRAC 3 to ATRAC 3 Not much better than with ATRAC 2. ATRAC 3.5 to ATRAC 3.5 Slightly better than ATRAC 3, relating to noise. ATRAC using Type-R DSP Faster DSP allows two pass bit allocation algorithm that looks for redundancy and makes better use of available bits, providing further improvements to high frequency performance. (see: Sony blurb on ATRAC using Type-R DSP). Not known to have any improvements to decoding. There are two sources of distortion. One is the chain of components that brings the sound to the MD's input. If you go analog-to-analog, you introduce the CD's DAC and the MD's ADC chips, each with its own artifacts. However, you can bring the digital data stream directly to the MD; then the only source of differences is the ATRAC compression algorithm. The ATRAC encoder removes information from the audio material in order to store it on the MD (5: 1 compression with loss). To make better MD recordings from CD, connect the MD recorder to the CD player via a digital connection (if possible). Thus, the ADC (poor in the first generation machines) cannot affect the sound quality. Otherwise, when recording via the analog input, make sure to adjust the manual recording level on the MD machine so that the meter peaks just above -12 dB (on the Sony MZ-1, never enable the AGC for CD recording). Yes, because the MD's analog to digital conversion circuits are involved, in addition to the ATRAC compression. High-end MD decks frequently have sophisticated analog circuitry, offering improved recording and playback performance over mid-range decks even when they share the same ATRAC chip. Providing you've got a clean source signal, analog recordings generally sound fine, giving nearly inaudible differences from digital ones. Note however that many computer soundcards have noisy analog output stages, so when recording from a computer, digital transfers are recommended (one exception is the USB based Xitel MD-Port AN1 which runs outside of the PC chassis and produces good quiet analog output). When making analog recordings, do set the recording level manually to avoid the audible effects of the Automatic Gain Control (AGC) circuitry adjusting the level during very loud and very quiet passages. One advantage of analog recordings is that MD recorders flag them "SCMS-penultimate", meaning that a digital copy can be made of them. One disadvantage of analog recordings is that track marks will be laid down based upon the recorder's detection of silences in the analog source (depending upon recorder settings and capabilities); this is less reliable than using the digital indications of track changes available in an S/PDIF (digital) signal from CD players. You will have the correct recording level when the level meter is just between 4 and 5 bars. Verified with an MDS-503 from Sony, between 4 and 5 bars on the MZ-R3 record level meter will give you somewhere between -3 dB and 0 dB. Regarding the 'R30: A user connected a 303 to the R30 using a POC (optical) cable and compared the two meters. The result: Just consider the top bar to be 'digital over' and try to adjust your level in such a way that the second bar doesn't light up too often when recording from an analogue source (even less when recording live). That should do it. Compared to the MZ-1 the R30 meter is not very useful. Digital recording provides the most convenience when copying CDs: no recording levels need to be set, track marks are copied from the CD perfectly, and analog to digital conversion artifacts (real or imagined) are completely avoided. The one problem with digital recording is that SCMS will prevent further digital copies to be made from the copied MD. Crutchfield's Tip of the Week is devoted to analog vs. digital recording to Minidisc. See also the ATRAC version table. In a word: No. The perceived problems with optical interconnects relate to an optical cable's greater theoretical potential to distort the digital signal, particularly to create small inaccuracies in the arrival time of data bits ("jitter"). However, in Minidisc recording jitter is not an issue since the digital input signal's sample values are recovered and passed directly into a memory buffer or into a sampling rate converter that is clocked with the clock embedded in the input signal. The sampling rate converter and/or memory buffer allow the audio samples to be subsequently read and passed to the ATRAC converter with an accuracy determined by the MD unit's internal quartz clock. Even if jitter was an issue however, it is doubtful that the short cable lengths involved in home HiFi systems could produce audible differences between optical and digital cables. Regarding the occurrence of outright bit errors due to a marginal cable: S/PDIF contains only parity information, there is no error correction capability. If the errors are bad enough to cause bits to arrive with incorrect values, the likely result is that the digital audio receiver will not be able to lock on to the signal. A short paper by DJ Greaves goes into further detail about S/PDIF, and has some comments about why jitter is not a problem even in equipment without buffers. Another paper by Tomi Engdahl goes into great detail about S/PDIF, even giving schematics for AES/EBU <-> S/PDIF conversion. Finally, Digital Domain has written a very comprehensive paper on jitter in digital audio systems. The short answer: If you are trying to make a digital connection between devices with differing signal types, you will need a converter. Core Sound sells something called a "Digital Format Translator" for $95 which will convert between coaxial SPDIF and TOS-link optical. There is more information on Core Sound's DFT page. A cheaper route, if you're willing to do a little electronics work, is to follow Shawn Lin's instructions for making a converter from parts. What follows is a discussion of audio digital interfaces. These interfaces come in 2 classes, optical and electrical. The optical format has two connector types: the small, squarish "TOS-link" connector and the optical miniplug, which has the same connector dimensions as a normal (electrical) mini-plug. You can buy optical cables with any combination of these two [male] connectors at the ends. TOS-link is usually limited to maximum cable lengths of 10 to 15 meters. The Sony part numbers for the optical cables are as follows: miniplug/miniplug: POC152HG, miniplug/TOS-link: POC151HG, TOS-link/TOS-link: POC-15HG. These cables can be ordered from Sony Parts (see below). SPDIF: (Sony/Philips Digital InterFace): This is the interconnect that is most often used on consumer DAT machines. The connectors are standard RCA phono connectors. This type of connector may also be lableled "IEC Type II" or simply "Digital I/O". Standard analog phono cables can usually be used for the digital data, however some cables that are designed for analog may not be able to carry the high rates needed for the digital data, especially over long distances. Many high-end audio stores carry special digital phono cables that solve this problem. [The pro-audio FAQ says not to use audio cables, but that video cables will work]. AES/EBU: This type of cabling is most often found on professional equipment. It uses three-pin XLR connectors. Cables designed for analog applications work fine for AES/EBU connections as well. However, note that shielded cables (most cables are shielded) must be used, otherwise unacceptable levels of radio or TV interference may be generated. This type of cabling is the preferred choice for long distance runs between digital audio equipment. It is important to realize that there are subtle differences in the control information that is sent along with the audio data on these different connectors. The two main formats of this information can be broadly categorized into Consumer and Professional. For most applications, if you are using the SPDIF or fiber-optic connections, the consumer format applies. For AES/EBU connections, the professional format applies. Some DAT machines will not operate at all unless the correct format is used. A 1 bit DAC is more correctly referred to as a Pulse Width Modulation DAC. A conventional 16/20/... bit DAC uses resistive dividers to add a value proportional to the bit significance of each bit to its output voltage. As more bits are added to the DACs resolution, the more significant bits' accuracy must be improved to at least the value of the least significant bit, or there is no point in increasing the resolution. It is quite difficult to make a resistive divider network with the required accuracy. There are two classes of DACs. One-bit DACs and multi-bit DACs. A 20 bit DAC is (theoretically) better than a 16 or a 8 bit DAC. You can't compare them with one-bit DACs because they use another principle to convert from digital to analog. Multi-bit DACs always convert different values for the same time period. One-bit DACs convert the same value with different periods of time. Multi-bit DAC: Fixed time period, varying voltage/current. I have done extensive testing with this, and have yet to find a single instance where the MD encoding/decoding affected the Pro-Logic encoding in any way. In every test I did, the surround steering information remained intact, and the result sounded precisely like the original. Rarely. A read-ahead buffer stores a few seconds of the audio material in memory during playback. The ATRAC decoder takes the data from the buffer, rather than directly from the medium. Thus, if the mechanism mistracks because of shock or vibration, the data continues to flow from memory while the MD machine recovers. If no more data remains available (when the disturbance lasts a long time), the audio material gets interrupted. Also note that the read-ahead buffer exists on every MD machine as part of the MD format. For the first time in MiniDisc players/recorders, Sony offers Skip-Free* G-Protection technology. Now you can jog with it, blade with it, board with it and enjoy other favorite activities while listening to uninterrupted, skip-free music. The G-Protection technology recovers laser position 10 times faster than previous designs! So it can withstand the impact of actual jogging: 8G impacts at 3 times per second. The laser pick-up adjusts its focal point quickly enough to react to bumps. When bumped, fine access returns the laser pick-up quickly back to its original position so the data can continue to be read without interruption. Disc can rotate faster to read out the data much quicker. *Eliminates or reduces skipping during many active uses. Yes. Modern MD machines (ca. 1997/98 and later) feature a 40-second read-ahead buffer (MDLP machines store 80 seconds in LP2 mode and 160 seconds in LP4 mode), but earlier machines only offered 10, and some of the first offered only 3 seconds of memory, such as the first production run of Sony MZ-1 portable MD recorders and the Aiwa AMD-100. Yes. The MD format stores data like hard-disk or floppy-disk drives in computers. The TOC contains a list of starting/ending positions and names for each track, like the directory in computers. Tracks can be erased, divided, combined, moved [or just ``swapped'' on some early models] and named like the files in computers. For example, after recording 11 5-minute tracks on a 60-minute MD, 55 minutes are used and 5 minutes remain. If the user decides to erase track #8, the TOC gets updated, and now 50 minutes are used by 10 tracks and 10 minutes remain. If the user now decides to make a 7 minute recording, no problem. After pressing the rec. button, the MD recorder seeks the next "empty" spot on the medium (according to the TOC) and starts. The resulting track consists of two separate segments of audio material: five minutes at the end of the MD and two minutes out of the space where track #8 used to be. During playback of the 7 minute track, the read-ahead buffer keeps the audio material seamless while the mechanism jumps between the first chunk of the track and the second one... Now try that on any sequential medium (DAT, DCC, analog cassette)! Sony introduced Scale Factor Edit in 1999 (the first machine was the DHC-MD575 bookshelf system). Scale factor edit is a function that changes the volume level of previously recorded audio by adjusting all the scale factors in each soundgroup. Users can adjust a whole track's level, or taper the beginning and ending of tracks. This can be used conveniently, for example, to equalize the volume of tracks recorded at different levels or to soften abrupt changes in level at track boundaries. The Scale Factor Edit function modifies audio data on the disc in a completely backward compatible way, any SF editing will be revealed in subsequent playback on all MD equipment. The MJ Magazine MDS-JA3ES article provides a good basis for understanding how this feature works. ATRAC (and other transform audio coders) store audio in the frequency domain. The samples are stored as floating point numbers, with an exponent and a mantissa. The so-called Scale Factor is the exponent, which is stored in 6 bits, giving 64 (2^6) possible values and yielding final sample values in the range of -120dB to +6dB. Each Scale Factor step is 2dB. During an SF Edit operation, each soundgroup is read in from disc, the Scale Factors within it are incremented or decremented by a certain amount, and it is written out again. It's a much cheaper operation computationally than decoding to the full waveform, scaling it, and then recoding it. Scale Factor Edit does have a limitation: If you use Scale Factor Edit to decrease volume to the point that some Scale Factors in the signal become zero, the information in those samples is lost and cannot be restored by a subsequent Scale Factor Edit operation to increase volume. Likewise, if Scale Factor Edit is used to increase volume beyond the point at which some Scale Factors in the signal attain the maximum possible Scale Factor value, previously distinct Scale Factor values will begin to "max out" at the highest value and the signal's fidelity and dynamic range will decrease unrecoverably. Due to this limitation, SF edit operations that taper track endpoints to or from zero volume cannot be reversed. Introduced on the Panasonic SJ-MR220 recorder, group mode allows tracks to be placed in distinct groups ("folders") on a Minidisc. This is quite helpful when several albums are stored on a single Minidisc since each album can be placed in its own group and treated [when group mode is enabled] as if it were the only set of tracks on the Minidisc. Up to 99 groups can be created, and tracks can be moved between groups (a track cannot be placed in more than one group however). When an MD with grouped tracks is played on equipment without group mode support, the group information is ignored and all tracks are accessible. All the track grouping information is stored in a specially formatted disc title; see Brian Youn's group mode description in his MZ-R909 review for further information. Many users have reported problems if the MD recorder experiences shock and vibration while recording. Apparently the read-ahead buffer also works for recording, but strong disturbances could cause the laser to erase other spots on the MD, like the TOC or existing tracks, thus damaging previous recordings. To remain on the safe side, the MD recorder should not be subjected to shock or vibration while recording. MD drives certainly buffer during recording, otherwise MDs could not make recordings over discontiguous free blocks on the disc due to the dead time during interblock seeking. The bigger problem is, what happens when the recorder is jarred and the hot laser skids across already recorded material? One of the brochures for the professional MD units mentioned that they had a special circuit to cut the laser power when any shock occurred, thereby avoiding overwriting [much] already written material. On the normal consumer portables, you could probably lose some material when a shock occurs during recording. In any case, they're able to recover and get back on track. The user-interface for title entry on many portable MD recorders is limited, requiring a button push to cycle past every letter. Most current home decks have a remote with a non-querty character input method. Notable exceptions are the Aiwa portable that uses the volume thumbwheel on the remote to select each character, and some modern MD decks (chiefly Sony) that allow titling with a separately available keyboard-like remote or even a standard PS/2 keyboard in some cases. There are 255 name blocks available, each one able to hold 7 characters, so the absolute maximum for all tracks combined is 255*7=1785 characters. The number of name blocks used by a track is: (title characters+6)/7 (rounding quotient down to nearest integer). The disc title is handled just like any other track title (the disc title is placed on track #0, which is actually the MD's free list). So, each track that has a title takes at least one of these blocks. This means that if you have 255 tracks, all must have titles of 7 characters or fewer, or some tracks must go without titles. It also means that MD does not have the capacity for a disc title plus 255 track titles, one track (or the disc) would have to have an empty title. In addition to these limits, certain units may not display or allow entry of long titles, for example Sony's MDX-U1 car player only displays the first 32 characters of a title. All modern (ca 1996 and later) MD decks have an "undo" function for just this purpose. Modern Sony MD decks also have a hidden super UNDO function. A user describes how to cancel a pending TOC update on modern Sony MD decks. This machine doesn't have a specific undo function, but it can be made to forget about the edits in a simple manner, without having to open the unit. When you have deleted a track by accident for example, you just unplug the unit. Make sure that the unit isn't playing or recording before you unplug it (press the Stop button first). Now wait for about 30 secs for the power supply capacitors to discharge. Press the AMS knob, and while holding it, plug the unit back in. If you're lucky the recorder will enter in Test Mode (it always did this correctly in my case). Now you can simply press the Eject button to remove the minidisc without the new TOC being written to disc! The reason that you must enter Test Mode is because when you just plug the unit back in, it still remembers that the TOC isn't written yet. The moment you plug it back in the new TOC is written to the disc and you have lost the deleted track forever! After you have removed the disc press the Repeat button to leave Test Mode. You have to unplug the unit and plug it back in to enter the normal user mode. I'm sure everyone who has a Minidisc deck has done this. You're editing down a disc, splitting blank spots away from other tracks, then deleting the blank spots - and all of a sudden, your quick fingers just deleted the track, rather than the space. This is usually followed immediately with loud obscenities. :) I hear that some of the new units have an "undelete" feature, but my MDS-302 does not have one. I did this once (twice actually, within a half hour) while editing down a disc on which I had made a one-time live recording of a choral performance, that could not be re-recorded. Desparate, I remembered that the MD unit only wrote the TOC (Table of Contents) to the disc when the disc was ejected. When you do edits, it's actually only changing pointers in memory, which are then all written at once to the disc when it's ejected. With this in mind, I unplugged the unit while it was still turned on. I removed the case, and examined the drive mechanism. There is a large gear at the back, and I found that by turning it by hand, it worked the eject mechanism, and the disc was slowly ejected as I turned it. Once I had the disc in my hand, I plugged the unit back in. I figured it would be confused, so I took a blank MD, slid the write-protect tab open so that it wouldn't write to it, then plugged it into my recorder. Once it figured out that it had a new, fresh disc, I then ejected it and re-inserted the original disc with the live recording on it. As I had hoped, the disc had been restored, and all the edits I had made (including the one wiping out an entire track) had been forgotten. Now, whenever I do any editing, I periodically eject and re-insert the disc (just to write the edits to disc). This way, if I DO mess up and have to go through the manual eject sequence again, I won't lose ALL of my edits. The MDS-501 can me made to "forget" about editing simply by unplugging it. Even if you turn it back on and eject the same disc (without removing it the hard way) your edits will be lost. The MZ-R30 writes the TOC-Area after pressing the Stop-button or, if batteries are in use, after disconnecting the AC power adapter. After deleting anything, the R30 begins playing the succeeding piece automatically. As long as the R30 is playing, the TOC-Area is not written. To Undo a delete, take away all power sources while the R30 is playing; the TOC-Area will be the same as before the deletion took place. But note, if you use the AC power adapter and LIP-12 or LR6 AA in the supplied battery case, you must first remove all batteries before disconnecting the power adapter, otherwise the TOC-Area will be written right after disconnecting the power adaptor. Sony, in the process of developing ATRAC, unknowingly employed techniques that were covered in prior Dolby patents. Sony made a licensing agreement with Dolby to avoid (or as the result of) a legal challenge from them. Dolby doesn't own all of ATRAC, just some part(s) of it. SCMS stands for "Serial Copy Management System" and is the way copies of digital music are regulated in the consumer market. In essence, it prevents more than one generation of digital copying. It is implemented through information that is added to the stream of data that contains the music when one makes a digital copy (a "clone"). When making an analog copy only the music is transferred so there is no SCMS, and copying is totally unrestricted. Decks considered "professional" -- usually more expensive and with pro features, such as balanced XLR input/output -- are exempt from needing SCMS. Different manufacturers' pro decks behave differently: some allow one to set the SCMS code how one wishes, some only if the pro i/o is used, and some ignore it completely. Play Deck       Connection     Record Deck     SCMS Problem? SCMS does not limit the number of times you can copy a certain CD or MD. For instance, you can make 20 copies of a CD - you just can't copy any of the 20 copies. Sony makes an adaptor for that bizarre headphone connection. It's $13.34 (US). Call Sony at 1-800-488-SONY to order one. The part number is: in the US: PC-MP1HG, in Asia: PC-MP1S. You can call Sony Direct Response at 800/222-7669, there are about 10 Sony Factory Outlet stores around the country and they can give you the location of the one nearest you. There is another Sony outlet store in the Grove City Outlet Mall, Grove City PA, three miles south of I-80 on I-79. You can order any Sony electronics accessory (such as remotes, manuals, etc.) direct from Sony. Sharp also allows the online ordering of parts from their Canadian website. Also at Pacific Coast Distributors (search for "Sony" and indicate model "md"). Chiefly (only?) for Sony's car MD units. Sony also has a National Direct Response Center at 800-222-7669, representatives there can help you troubleshoot problems with Sony equipment. A $35 diagnostic fee is charged, but will be subtracted from the repair charges. Partmaster Direct (A Dixons subsidiary): 0870 9090444. Enclose a note describing the problem in simple and clear English. Any storage case for audio cassette tapes will work just fine for MDs, as long as it does NOT have individual compartments into which the cassettes are to inserted. Any open shelf for cassettes will be just the right depth for MDs, with about an inch of extra headroom which is actually fairly convenient (leaves room for your hand to grab a disc). I did find the Napa Valley "Cassette Crate 12", a single-shelf crate that (obviously) holds 12 cassettes, and it clearly would hold about twice that number of MDs in their little sleeves. So presumably the 2-shelf model that I got might be called "Cassette Crate 24". And any other brand would be just as good. Napa Valley Box Co. Inc.
Thomas Halasz (thalasz@totalnet.com.br) reports that the hard plastic box that comes with Ferrero Roche Chocolates (Italy) is the perfect size for holding 25 MDs, sans jackets. The box is transparent with an articulated lid. The chocolate is good too. You can also check the MD page accessories table for suppliers of cases. A standard Avery label fits almost perfectly onto a minidisc sleeve with no cutting. It is Avery Label J8666 (perhaps also known as J7666). It is their 3.5" disk face only label. Word can automatically format for this label in it envelopes and labels section. From the Labels dialog, click the "Options" button and then the "New Label" button and you will see a window with entry boxes for the above data along with a text box where you can enter a name for this type of label. (I used "Memorex Minidisc".) Click the "OK" button and the label data will be saved for future use. Note that the actual dimensions of the label are slightly different than these (probably because Word and my printer don't exactly agree on how long 1" really is...) but these are what I found to work after some trial and error. Note also that this is for the main label only - also on the same sheet are 3 skinny labels that aren't printed to (but are accounted for in the side margin). If your printer will feed such a small sheet (which mine, surprisingly, did) then you're all set. If it won't, then you can tape the sheet to the top, right corner of a regular piece of paper and feed that through. The switch has no electrical connection and is only provided to help you identify which batteries are charged. If you carry many batteries in the same bag, the ones showing a red dot can indicate empty, while those with the switch in the other position can indicate charged. You have to remember to move the switch after changing or charging batteries. Minidisc "Long Play". Introduced in September 2000 on the Sony MDS-JB940 deck, it is a new encoding method for audio on Minidisc that offers two modes: one gives 160 minutes stereo ("LP2"), the second gives 320 minutes stereo ("LP4"). LP2 is stereo encoded (each channel is independent), LP4 is joint-stereo (both channels are coded simultaneously, see below). So called "ATRAC3", which is also used in the Sony MemoryStick Walkmans, Vaio Music Clip and Network Walkman. Sony has chosen a confusing naming scheme for their variations of ATRAC. All Minidisc equipment before the advent of MDLP used ATRAC1 of some generation or another (note the lack of a space between ATRAC and the number 1). We should really be calling the ATRAC of the MZ-1 (Sony's very first MD machine) ATRAC1 version 1.0, and of the MDS-501 (the first high-end MD deck) ATRAC1 version 2.0, etc. By this nomenclature, Sony's current MD decks (ca. 2001) are using ATRAC1 version 4.5 and ATRAC1 Type R. MDLP uses a new and incompatible encoding called ATRAC3 version 1.0, which we shorten to just ATRAC3 (note again the lack of a space between ATRAC and the 3). It was renamed to ATRAC3! Seriously though, audio coders are evolving computer programs with few natural dividing lines between them, though perhaps it's fair to rename them when their stored formats become incompatible. ATRAC2 (described briefly and in slightly more detail) differs substantially from the original, existing ATRAC system, having twice the transform window size (1024 samples [23.2ms], vs. 512 samples [11.6ms]), encoding tone components separately from other spectra, splitting the input signal into 4 bands instead of 3, and using Huffman coding on the final bit stream to squeeze out redundancy. Though ATRAC2 was never incorporated into an exported Sony product, the Sony PlanetMG FAQ states "a second format, called ATRAC Data, is used by Sony in a digital music distribution system offered via the SkyPerfecTV satellite service in Japan". 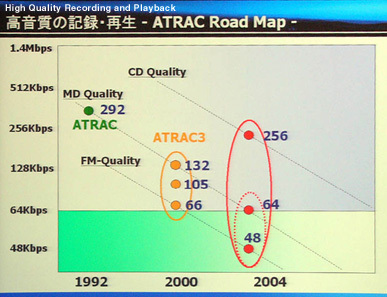 This "ATRAC Data" is most likely ATRAC2, however Sony's MDS-DL1 and SkyPerfectTV press release makes no mention of "ATRAC Data", and certainly any audio stored on a Minidisc would have to conform to existing ATRAC standards for Minidisc. ATRAC3 (as described briefly by Sony's ATRAC3 information page and in more detail by a TechnoWorld article (PDF)) appears quite similar to ATRAC2 in structure. The only difference is that ATRAC3 again uses the original ATRAC's QMF (Quadrature Mirror Filters) for band splitting, whereas ATRAC2 used PQF (Polyphase Quadrature Filters). Given the popularity of MP3, and the fact that there was no existing ATRAC2 format to be incompatible with, it seems plausible that marketing arguments, as much as anything else, convinced Sony to rename their high compression codec ATRAC3. ATRAC3plus is a new audio codec from Sony that differs substantially from ATRAC3 (ATRAC4 would in fact have been a better name). Though not used in the original Minidisc, ATRAC3plus is used in Hi-MD and Sony's solid-state and CD walkman products. It uses a transform window 4 times bigger than ATRAC3 (4096 samples, or 92ms) and splits the input into 16 sub-bands prior to the FFT (MDCT) and subsequent bit allocation processing. Sony has measured ATRAC3plus fidelity at 64kbps and found its audio quality equivalent to 128kbps MP3 (mech. trans.) Sony's current PC software produces ATRAC3plus output at user selectable bitrates of 132, 105, 66, 64 and 48 kbps. AV Watch Japan has done a bit of ATRAC3plus signal analysis and comparison with ATRAC3 (mech. trans.) ATRAC3plus is described briefly on Sony's ATRAC3 site (local copy). The track is played as silence. A 20 min. LP2 track is played as 10 min. silence. A 20 min. LP4 track is played as 10 min. silence (because the MD unit thinks it's playing an SP mono track). The non-LP machine's display of the track name is also likely to show the characters "LP:" at the beginning of the title. These characters are put there by MDLP recorders in their factory default setting (this feature, called "LPstamp", can be disabled). MDLP machines will also strip off the initial "LP:" (if LPstamp is enabled) when displaying LP track names. Standard ATRAC ("SP") is 292kbps, LP2 is ~132kbps, LP4 is ~66kbps. The LP mode bitrates are not simply 146kbps (292/2) and 73kbps (292/4) for this reason: In LP2 and LP4 modes 20 bytes of dummy data per 212 byte soundgroup are used to keep compatibility with SP mode, making them appear as normal ATRAC soundgroups containing silence. This allows LP2/4 tracks to play as silence on non-MDLP equipment. The intention is that older MD units should not produce random digital noise when playing LP tracks. Yes. Sony defined a 2 bit field in the original MD specification to indicate non-standard track codings, allowing players to ignore unknown track types (see the MDLP-mode bit in the fragment headers). Unfortunately, non-MDLP units seem rather to ignore the mode bits and will try to play the MDLP audio anyway. ATRAC3 in LP4 mode encodes audio in "joint-stereo" mode, encoding the left and right channels in one step (i.e. jointly) and exploiting the similarity between channels to increase compression. Because of this, the capacity increase when encoding a mono signal is not 2:1, but somewhat less. This, and the added complexity of a fractional increase in capacity, apparently disuaded Sony from providing a mono LP4 mode. ATRAC3 in LP2 mode on the other hand could be used to offer double playing time mono, but Sony's current machines do not offer it. Sony has not given channel separation specs for LP4 mode, but coding two completely unrelated signals on the left and right channels will not give spectacular results. LP2 mode is reportedly quite close to standard ATRAC. LP4 mode has noticeable artifacts, but is still suitable for portable applications. Brian Youn has assembled some user comments on MDLP mode's quality. There are also comments in the Sony MZ-R900 equipment browser entry. The Sony MDS-W1 double MD deck will not move LP mode tracks properly. When the MDS-W1 moves LP2 and LP4 tracks to another disc it sets their SP bits on in the UTOC track header, turning LP4 tracks into (silent) SP mono and LP2 tracks into (silent) SP stereo. The track's audio data is copied properly however, so with careful use of TOC cloning to restore the LP bit in the track header, copied LP tracks will play correctly. Windows users can download this ATRAC3.zip file, unpack it into a new folder, then right click on the atrac3.inf file and choose "Install". This loads an ATRAC3 codec (.acm file) into the system so that .wav files containing ATRAC3 audio can be played (and recorded!) with your normal system tools (Sound Recorder, Windows Media Player 7, Winamp, Goldwave [encode ATRAC3 in Goldwave by selecting "File->Save As->Save as type: 'Wave', File Attributes: 'ATRAC3'"]). PlanetMG, a website that offers ATRAC3 and Windows Media audio files for download, also lets you download an ATRAC3 plugin for the Windows Media Player. RealPlayer's "RealAudio 8" supports Sony's ATRAC3 format as well. After loading you can listen to the following audio snippet of "Sichia". The example was intentionally chosen from difficult material, in order to highlight the audio quality differences at various bitrates. There are publicly available ATRAC3 files on the Web, however Sony is now using a custom format instead of WAV format; the header is incompatible with WAV so those files cannot be directly played with standard sound tools. However, the data is the same, all that is needed to make one work with the other is to replace one header with the other. This audio codec was assembled from publicly available bits on the Web and hence may not represent the ATRAC3 codec Sony currently supplies with their MDLP and MemoryStick audio devices. It is supplied for educational purposes only, please address all questions about commercial use and licensing of ATRAC3 to atrac3@Sony.co.jp. Sony and Real Networks negotiated a deal in which Real adopted ATRAC3 for their RealAudio8 wideband audio coder. The freely downloadable RealSystem Producer Basic (available for Linux, Mac and PC) can encode ATRAC3 audio at 352, 264, 176, 132, 105, 96, 64, 44, 32 and 20kbps. The 146kbps ATRAC3 rate is apparently only available with the $200 RealSystem Producer Plus package. After you have downloaded and installed RealProducer, start it. It initially displays a "New Session" dialog box, asking for the name of the .wav file you wish to convert, and the name of the target ".rm" file you wish to create; browse to these or fill them in. After completing this you will be in the main dialog window. Here, the bitrate is selected in an indirect fashion through the "Target Audience" checkbox. This checkbox is intended for you to specify the sort of network bandwidth your audience will have. What it does is select ATRAC3 bitrate of the file you will encode. You can see the bitrate assigned to each possible network bandwidth setting by going to the Options->Target Audience Settings->for RealAudio Clips menu. Back in the main window, choosing from the "Audio Format" pulldown (e.g. "Stereo Music", "Music", etc.) allows you to further select which of the predefined bitrates you will use. Again, to see these correspondances, you must use the Target Audience Settings dialog box. Finally, click "Start" in the Recording Controls section in the lower left hand side of the main window to start the process. Your .wav file will be encoded into ATRAC3. After it completes, you can click the "Statistics" button to confirm the encoding bitrate and audio sample duration. You will need Real Network's RealPlayer8 (free download) to play these clips once you have encoded them. Yes, there is a full translation of the MDLP FAQ in Japanese. Announced in mid-2001 and first introduced on the Sony MZ-N1 portable recorder in December, NetMD is an extension to the Minidisc format that allows direct transfers of compressed, ATRAC audio from a PC to Minidisc via USB interface. Audio transfers can be conducted at rates considerably faster than realtime (up to 64x for LP4 audio on certain units). NetMD equipment requires complementary NetMD PC software for control and data transfer functions to be conducted. By standardizing the PC<->MD USB protocol, Sony assures compatibility between NetMD equipment and NetMD software packages from various manufacturers. On the View menu, click Devices. On the pop up Preferences Window, under Deivces click Add A New Device. RealOne connects to its mothership server and lists all applicable portable device plug-ins. Click the "Sony Music Devices" check-box. It then asks you to "Click the Install button", do this. When RealOne player completes the download and installation, click "OK" to restart it. On the Tools menu, click Check for Update. In the AutoUpdate window, click Devices. Select Sony Music Devices Plug-in and click Install. Sony also has instructions for downloading and using RealOne Player. Sonic Stage (Sony/Windows only): Supercedes OpenMG Jukebox (see below) as principal Sony tool for downloading audio to NetMD devices. Ships with 2003 portables (MZ-NE410, ... MZ-N10). OpenMG Jukebox 2.2 (Sony/Windows only): This is the primary tool Sony provides with their NetMD equipment. Also supplied with Sony's solid-state music players (MemoryStick and Network Walkman), it allows downloading of compressed audio to the NetMD unit, as well as titling and track renumbering. OpenMG Jukebox supports the SDMI concept of track "check-out", wherein at most 3 copies can be downloaded to Minidisc before a "check-in" is required (the check-in operation deletes the downloaded audio track from the Minidisc). Simple Burner (Sony/Windows only): This software is shipped with Sony's US NetMD units (download) and simplifies the downloading of tracks from PC-mounted audio CDs to Minidisc. The SDMI check-in/check-out restriction is absent in this software and downloaded tracks may subsquently be deleted from the Minidisc. Unfortunately, Simple Burner does not support SP mode downloads. Beat Jam (JustSystem Inc./Windows only): Supplied with Panasonic's NetMD equipment (mech trans of BeatJam announcement). Muria (Kenwood/Windows Only): Supplied with Kenwood's MDX-J9 NetMD boombox. InterJuke (JVC/Windows Only): Supplied with the JVC SS-NT1MD mini-compo system. Open/NMD Project (Open source community/Unix, Linux and MacOS): In development; currently allows track titling and renumbering via shell commands. Win NetMD (Christian Klukas/Windows): In development, currently allows analog, realtime uploading from NetMD equipment to PC. Windows GUI and command line based versions available. Xmd v0.1 (Open Source Community, Pete Bentley/MacOS X, Darwin, FreeBSD, etc. ): In development, currently only playback and titling functions are present. M3U2Sburner (Paolo Sessa/Windows) M3U2SB automates the download of mp3 files to NetMD, using the procedure suggested by Dino. It will also extract titles from mp3 files and put them into the Simple Burner database so they don't need to be inserted manually. SimplerMD (Clint Mers/Windows) Similar to M3U2SB, SimplerMD automates the Nero->SimpleBurner route, even handling more songs than can fit on a single CD. GNetMD (Pete Ryland/Unix/Linux). A free suite of tools for using NetMD on Unix and Unix-like systems. It currently includes an xmms plugin and a GNOME2.0 GUI and a gnome-vfs layer is currently in development. Sony's MZ-N1, MZ-N707, MZ-N505, MDS-NT1, MZ-S1, LAM-Z1, CMT-C7NT. Protected Tracks Audio tracks downloaded to Minidisc by OpenMG Jukebox and BeatJam are marked as "protected" and cannot be deleted or divided by most Minidisc equipment; only a "check-in" with NetMD PC software will delete the track. (This feature ironically makes Minidisc portables with NetMD downloaded tracks as inflexibile as solid-state MP3 players). Tracks downloaded with Simple Burner do not have these restrictions however and behave like normally recorded MD tracks. PC to MD Download Only Only audio downloads (PC->MD transfers) are possible. Presumably for reasons of digital rights management, audio uploading (MD->PC) is not possible. (If this strikes you as oppressive, please consider sending polite email to netmdfeedback@am.sony.com; Sony staffers compile and report customer email comments on NetMD uploading to Robert Ashcroft, US VP of Portable Audio. We petitioned Sony on this topic last year, but have yet to see any result). SP-mode Quality not Available Users can create SP, LP2 and LP4 mode tracks on Minidisc through OpenMG Jukebox downloads, but audio imported into OpenMG Jukebox (from CD, MP3, etc. sources) is converted and stored on the PC only in LP2 or LP4 format ATRAC3 files. So even when these files are downloaded onto the MD as SP mode tracks, the tracks cannot exceed LP mode quality. NetMD downloads through Simple Burner create only LP2 or LP4 mode tracks. Known elements of the protocol: The Open/NMD project is documenting the protocol as it progresses. Further Protocol Documentation: The FreeMD documentation sheet has low level details of (known) NetMD USB transactions. Encrypted PCM transfers for SP mode tracks: Judging from the careful experiments of Lance Birch, it appears that when NetMD downloading is being used for creating Minidisc SP mode tracks, the OpenMG software decompresses the [always LP2 or LP4 mode] PC file to standard 16bit, 44.1kHz PCM audio, encrypts it, and downloads that. The fact that PCM is being used for recording SP mode tracks is heartening since it indicates that NetMD downloads could retain SP mode audio quality, given the right PC software. Though current NetMD recorders reportedly offer only 1.6x speed downloading for SP mode tracks, USB 1.1's 12Mbps bandwidth would allow downloads at up to 8x realtime. Certainly the technology in Sony's MXD-D40 4x speed CD->MD dubbing deck could be directly applied for this purpose. Unadulterated OpenMG file data transfers for LP2/LP4 mode tracks : Birch's experiments reveal that the audio data transferred over the USB link (sent in blocks of 4096 bytes) is nearly identical to the original contents of the OpenMG music files on the PC. Marc Britten comments "the data transferred is not 100% identical, approx every 3 1/2 blocks an 8 byte block of data is inserted (we think this is a key) and the 8 bytes of OMG data that appeared just before that key is repeated." Dino Inglese, a Minidisc T-Station message board member offers this tip for using Simple Burner to circumvent OpenMG Jukebox (see his humorous original posting). CAVEAT: You will need Nero, and Nero's Imagedrive feature, or something similar that can create a virtual CD disc image and allow you to mount it to your desktop. Open Nero, select Audio CD from the presets and drag all the MP3's you want into it. Nero is far less picky about formats and sample rates. I found this method foolproof. Use Nero's Imagedrive (bundled with Nero) to mount the .nrg (CD-image) you just created. Lets say Drive 'F' for this example. I am not an expert, but I found these first 3 steps took around 2 minutes or less for a regular size audio CD (i.e. burning and converting about 10 MP3 tracks to an audio CD 'image' on my hard drive). I have a 1GHz/PIII, so that helps with the MP3->PCM conversion times. A faster machine would mean proportionately faster MP3 conversion and image creation. Select your 'virtual F' CD drive in Simple Burner and burn it to Minidisc. When you are done, trash the large .nrg file sitting on your desktop. If your machine is fairly fast then Simple Burner's CD->ATRAC conversion is done in on-the-fly in RAM with the disk hardly ticking over at all. You are using reliable software. Unlike OpenMG, files aren't left all over your hard drive. You can delete and re-arrange the downloaded tracks on your MD without having to resort to connecting it back to your PC. It is faster and doesn't thrash your hard drive. LP2 audio @ 16x is 2.1Mbps as well (i.e. 132kbps*16). SP mode audio at 1.6x is 2.25Mbps (i.e. 1411.2kbps*1.6). (Observing this, perhaps driver or interface problems that restrict NetMD USB transfers to roughly 2.5Mbps really are limiting the speed of SP mode transfers! If so, the answer is yes, USB 2.0 would help, but so would simply fixing whatever the USB 1.1 problem is). NetMD commentary at IGN for Men. In terms of function, think of Minidisc as a cross between CD and cassette. Like cassette you can record from any audio source and playback through headphones or a home HiFi. Like CD the audio is stored digitally, the sound quality is excellent, and you can easily skip to your favorite track. Unlike either CD or cassette you can edit the recorded audio to your heart's content, dividing it into tracks, naming tracks and moving them around, and deleting what you no longer need. Unless you have NetMD equipped Minidisc gear however, the only route onto or off of a Minidisc is through realtime recording and playback (except for the high-speed CD/MD decks). And NetMD or not, you can't get at the compressed audio directly from a computer. This is the biggest functional difference between MD and computer connected MP3 players and CD-R burners. Yes, it's true, except that when you record your MP3s onto Minidisc, you have to do it in realtime, by "playing" them on your computer and recording to MD through your PC's soundcard at the same time. When you do this your MP3 is converted to ATRAC format (Sony's compression system) by the MD recorder. After that you can move, edit, delete, and replace tracks using the MD recorder, as you like. Well, if you never do field recording, and don't mind looking positively silly walking around with a CD player in your hand, and are happy to fire up your PC everytime you want to take some new tunes with you, and never want to delete or change tracks on a disc after you grow tired of a few, then I'd say go for the CD player, definitely! Seriously: one must weigh this question for themselves. There are tons of happy MD and CD campers out there, just consider the usage patterns that are likely to be convenient for you and whether MD or CD fits them better. When the first Minidisc unit appeared on the market years ago, the difference between a CD and an MD recording of the same CD was discernable without a great deal of concentration. However, over the years, ATRAC (the compression technique employed by Minidiscs) has improved greatly, and now it requires careful listening with senstive ears and expensive equipment to hear any difference between a CD original and an MD recording. See our collected assesments of MD audio quality by members of the Audio and HiFi press. From Computer Equipment: Connect the computer's headphone jack to the MD recorder's line-in jack (see previous) then use the CD-player program on your computer to play the CD track while recording on the MD recorder. See also the MP3 handling tutorials. For transfers from the PC to Minidisc, Sony has introduced NetMD, a feature that allows high speed downloading of compressed audio over USB. But it is a one way trip, once downloaded the audio data on Minidisc is no longer accessible from the PC as data, it can only be "accessed" by playing it back as music. As for direct transfers from Minidisc to PC, such a capability would be great! (And a petition was sent to Sony asking them to add it.) Unfortunately Minidisc was designed with a so-called "audio/data firewall" that prevents the ATRAC audio data on MDs from being accessed directly by computer. This was done to comply with Recording Industry concerns over music piracy. (The fact that Sony has introduced the Digital Relay CRX10U-A2 [a portable MP3/audio CD player that is fully USB connectable for seamless audio/data transport to/from PC] is an irony due to the CD's grandfathered status as a computer peripheral that appeared before the Home Recording Rights Act [a law that impedes consumer bit for bit copying of audio content, see SCMS]). One year after Minidisc appeared, Sony announced MD Data -- it consisted of a slightly modified Minidisc blank and the MDH-10, an MD data drive with SCSI interface. This permitted users to use MDs as a computer data storage format. Unfortunately, due to the requirement for a firewall, MD Data drives cannot read or write ATRAC data on Audio MDs. Despite the built-in firewall, one company does sell a system for direct computer access to ATRAC audio data. By modifying the firmware in Sony's original MDH-10 data drive, EDL in Britain has been able to create the Minidisc Transfer Editor, a PC package allowing direct computer based transfer of ATRAC from MD to PC, with ATRAC to .wav file conversion done on the PC. The system is intended for audio professionals (radio stations, etc), and carries a price tag (~US$5000) to match. They can carry the music or other audio material from an MP3. You do this by playing the MP3 on your computer and recording to MD through the computer's headphone jack, connected as in the previous question. Yes, the Hi-MD format allows you to use your Hi-MD recorder as 1GB external USB drive. Prior to Hi-MD, [std-MD] audio MDs were not capable of holding computer data. A now-obsolete branch of std-Minidisc, called MD Data, was capable of holding 140MB of data per disc (functioning much like a Zip or floppy disk, but using Minidisc technology). MD Data discs were not compatible with std-MD audio discs. You can read about the old MD Data units in the Equipment Browser. Connect the headphone jack from the radio to your MD recorder, as in the previous question. Yes! Just as in question one, through the headphone or line-out jacks on your cassette deck. NOTE: RCA cable is also known as "phono cable", or in Europe, as Cinch cables. Microphones, Vinyl-LPs (works well! ), Digital-Audio tape, VHS/DVD audio (soundtracks, etc. ), Video-game music (connect through headphone jack as in question (1)), telephones, electronic musical instruments, etc. With the right cable or microphone, you can record any audio source to MD. With the proper cables, yes. You would use the same analog cables listed above for recording to another audio device from MD, simply switch the inputs/outputs. For a computer, this would mean connecting an analog cable (usually a 1/8" male to 1/8" male miniplug cable) between your MD unit's line out to your sound card's line in. If you're looking to transfer audio from MD to your computer digitally, you need an MD unit that is capable of digital output (all current portable MD recorders lack this feature, but most home MD decks have it) plus the correct digital audio cable. A good piece of free software for Windows-based machines that will record an incoming audio signal is MusicMatch. Yes, almost all. The Minidisc decks usually have finer editing precision when dividing tracks (so called "rehearsal mode" with 11ms or 60ms accuracy), and some have PS/2 keyboard connectors to make titling easier. Decks may have somewhat better analog input/output quality (but unlike portables, usually do not have microphone inputs). When recording digitally from a CD, MD decks and portable recorders are essentially equivalent. The one major difference is that home MD decks usually have digital output, the portables do not. A player only plays MDs, a recorder can play and record them. The only two units that feature an AM/FM tuner are the Sony MZ-F40 MD player (released in May 1997) and the new Sony MZ-G750 MD recorder (released beginning of 2001). Technology is always advancing and rendering older mediums obsolete. It is true that Minidiscs have been around since 1992, and have had a slow time picking up momentum. However, Minidiscs have proven their advantages over lots of other competing products (one of the best things going for Minidiscs is that the discs are cheap! ), and will certainly continue to appear on store shelves for years to come. The MD and the 3-inch CD-Rs used in the Sony CD1000 are completely different. MD: magneto-optical recording on cartridge enclosed 64mm disc. CD-R: dye based (i.e. optical) recording on an unenclosed 300mm or 80mm (3-inch) disc. The two formats are completely incompatible. Magneto-optical vs. Dye based recording. You need a magnetic head and laser in the former, laser only for the latter. Max write speed for MD is 176KB/s to 352KB/s (e.g. home units with high speed 4X CD->MD copy and commerical Kiosk recorders). Current (ca. 2001) max write speed for CD is 7.1MB/s (e.g. 40X CD burner). The S/PDIF (Sony/Philips Digital Audio Interface) standard used by consumer audio gear such as Minidisc, DAT and CD equipment carries audio samples for the left and right channels (at 32, 44.1, or 48 khz, and up to 24 bits wide) as well as several status bits (e.g. copyright and track information). Although in theory it would be possible for consumer S/PDIF to carry track title information (there are unused bits in the data stream [in fact in S/PDIF "Professional" mode, ASCII information about the audio source and destination can be transferred]), carrying such information was not made a part of the consumer S/PDIF specification and hence no consumer equipment implements it. A brief HTML document and more complete PDF document give further details about the S/PDIF standard. The MD and mini-CD track pitch and optical parameters (spot size) are the same however. Yes, the PC-Link will work on pretty much any* MD recorder since it is just a USB to audio converter and all Minidisc units can record an audio signal. * If it's a USB to digital (e.g. TOSlink) PC-Link it will not work on those rare MD recorders (e.g. MZ-R5ST) that have only microphone or analog audio inputs. Whether the audio from a DVD movie can be copied digitally depends upon the DVD title itself (i.e. the content on the DVD disc) and how the copy-protection permissions were set on its audio track. Judging by user reports, DVD movies seem generally to be set to not allow digital copies of their audio tracks (however out of keeping this may be with the spirit of the AHRA). The availablility of DVD titles with digitally copyable audio tracks may vary from region to region, and may be more likely with European titles.